The morning wake up call echos through a hazy mind of deep sleep and the relentless yelps of the hippos making their way from the grassy plains back to the safety of the rushing Mara river. This time of year sunrise comes early in the Mara. November is early summer, the short rains have begun to fill the afternoon sky’s with huge puffy thunder heads, certainly a beautiful time of year in Kenya. As I transform from the place of dreams to the reality of fulfilling them I smell fresh coffee being delivered, accompanied by the voice of our Masai attendant saying "good morning". It is surly a welcoming way to start a new day. It's 4:30 am and a rush of excitement has found its way into my body. 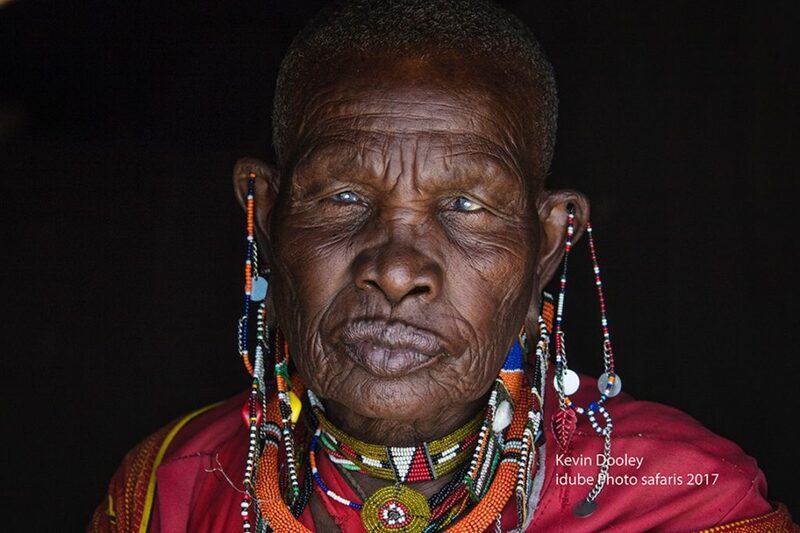 Today I will be photographing the Masai of the Masai Mara Nature Reserve in Kenya. 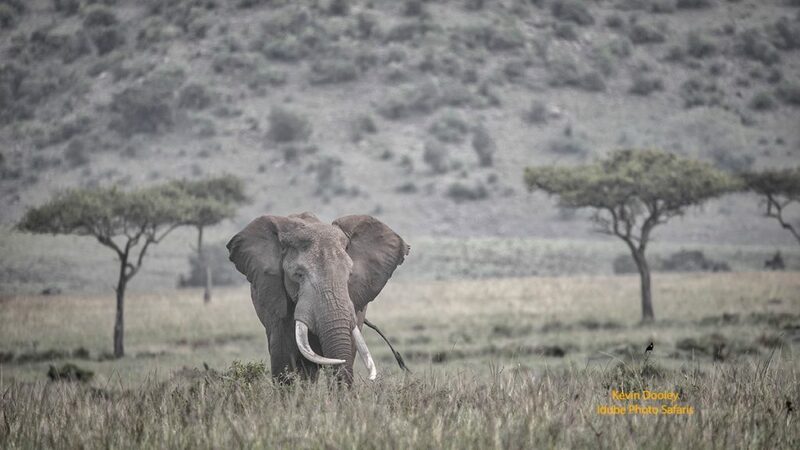 I love Kenya, the Masai Mara is a stunning and beautiful place where I can create a special kind of wildlife image. The Mara is a place where the wide open spaces that lack thick bush and allow me to create images that have very little background and foreground clutter. Of course, I am happy to photograph wildlife anyplace in Africa, it’s just different here. Subjects are able to stand on their own and gain all the attention. I suppose in a way it’s easier to create images in this environment. Less time spent waiting for the wildlife to step into the perfect place where tree limbs and brush do not interfere with a creating a clean look. I can not count the number of images I have tossed because of tree limbs and leaves interfering with faces and eyes. However, the crowds of the Mara do get to me. With the ever present Safari trucks they can be a huge disruption, interrupting with the wild and natural feeling of this stunningly beautiful wilderness. Yes, we do concentrate on traveling to the more remote areas, however we also need to be where the action is. At times that can mean traffic jams, especially during the migration. I suppose a small price to pay to have the honor to be present and create images in one of the worlds most amazing places. The day is already showing signs of life, the night stars and bold darkness are giving way to a horizon filled with dim light and the sounds of Africa are almost overwhelming. The many varieties of birds are trying to outdo each other, making sure to let all their fellow competitors know they own the area. Who knows what this morning will bring to my senses, eyes, and mostly my lens. It is starting out well. My stomach growls, it’s time to put on some shorts, a khaki shirt, safari boots, and an Idube ball cap. Let’s roll. Just outside the Masi Mara reserve, our home, the Sanctuary Olonana Safari Camp, rests along the Mara River. This camp has a proud and significant presence that only such a magnificent lodge can get away with. I am very picky about the camps I take rest in. I need a feeling to run through me, the Africa of the great safari stories, the explorers, and the very essence of my imagination to be fulfilled. This camp has that. I am obsessed with Africa, it runs deep in my blood. 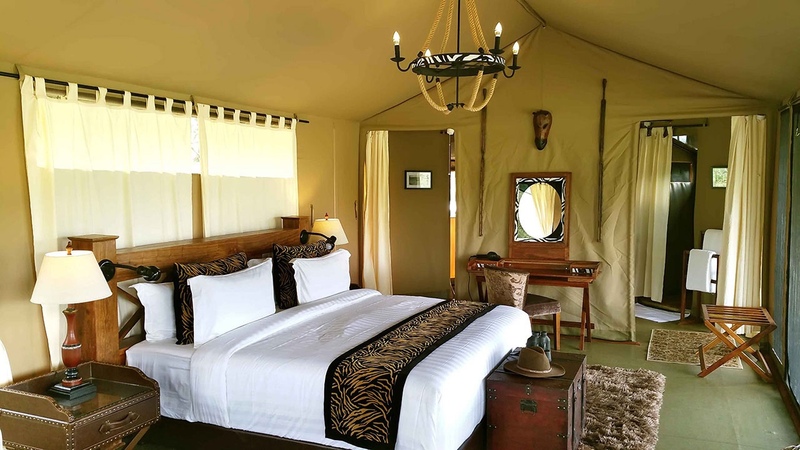 After all, dreams are made for fulfilling and this Safari camp is one of those dreams. The deep smells of the dark African woods that make up the furniture, the texture of the canvas walls and thatched roofs make up the essence of this setting. The books and photographs of the explorers of the past, the fine China and gourmet cuisine, are just a small part of this over all experience. 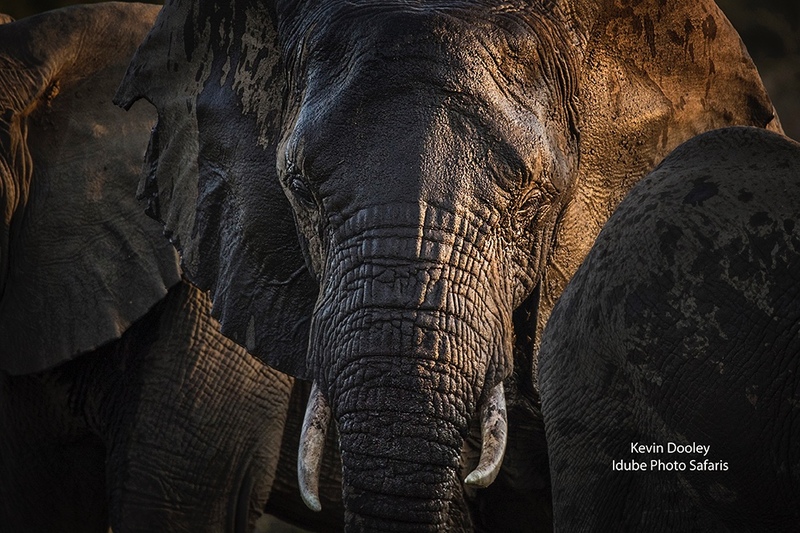 Yes, AFRICA lives deep inside me, but not just the wildlife, the amazing place and people are also a big part of Africa for me. Every morning we travel from the thick riverine woodlands, where our lodge resides, to the open plains of the reserve. A rough and well rutted dirt road is our pathway to the Mara, passing by zebras, elephants, and an assortment of antelope. 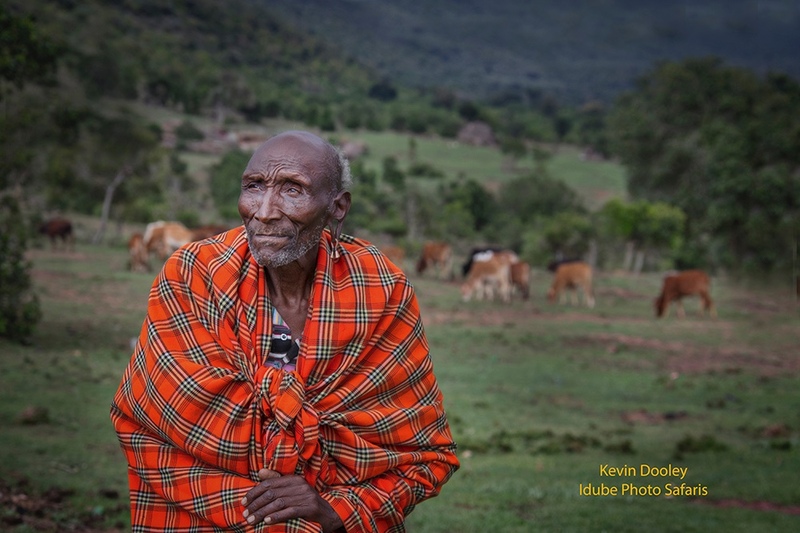 However, my attention is always drawn to the site of the Masai villages, the colors, the cattle, and the curiosity of a native people that have not completely given up on living the traditions and ways of their past. I suppose, in a lot of ways, I am obsessed with photographing people as much as I am photographing wildlife. I know that this is a place where my camera needs to spend some time. A place where I can fill my creative cavity with overflowing happiness. 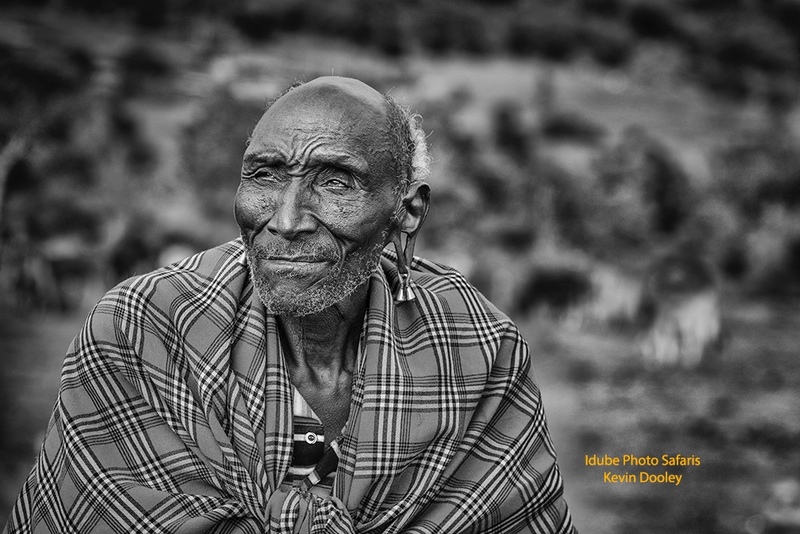 I know that in these villages I have found a gold mine of stunning possibilities to photograph a stunning people, the Masai. We spend the morning searching and photographing some of Kenya’s most inspiring wildlife and then sit down to a mouthwatering lunch. We indulge in a plate of pan fried Tilapia, oven roasted potatoes, mixed vegetables, and cheese cake with fresh fruit. 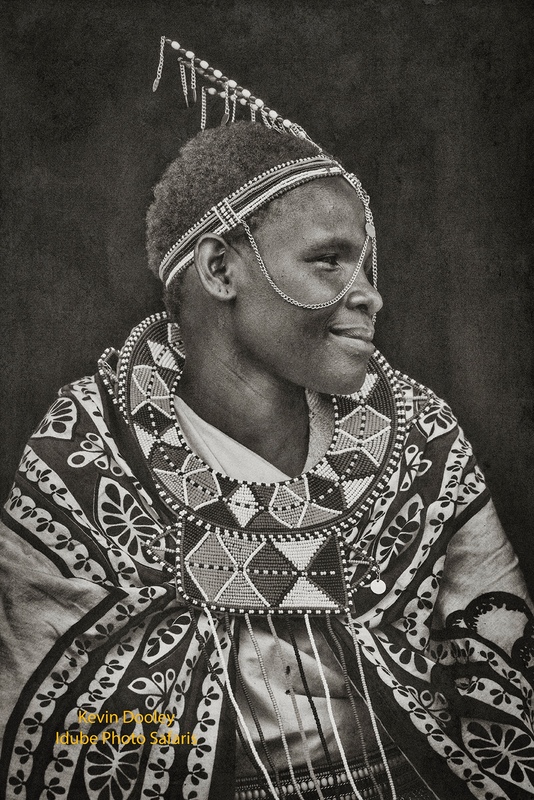 Then it’s time to photograph the Masai. An afternoon nap has surly entered my mind, but the distant thunderstorms rolling in and the excitement of the photography are pushing me into the Land Cruiser and we are on our way. 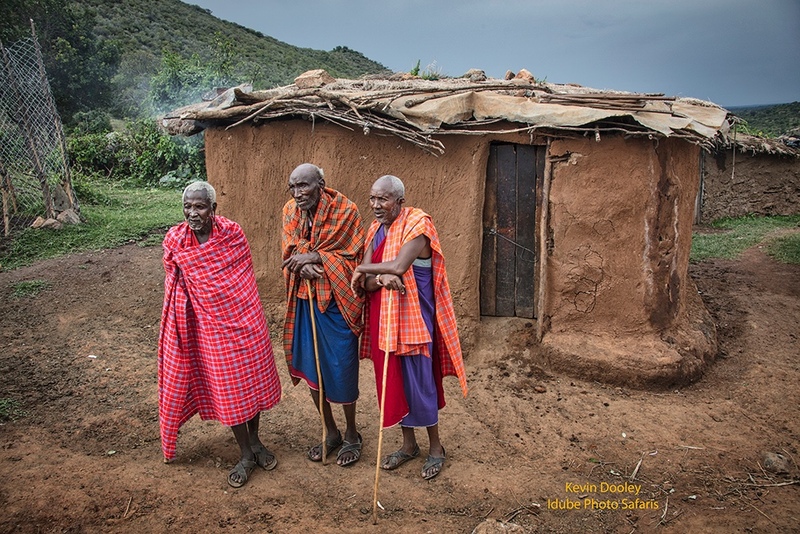 It's just a short 10 minute drive from the stunning Olanana Lodge to the Masai village and in no time we are there. 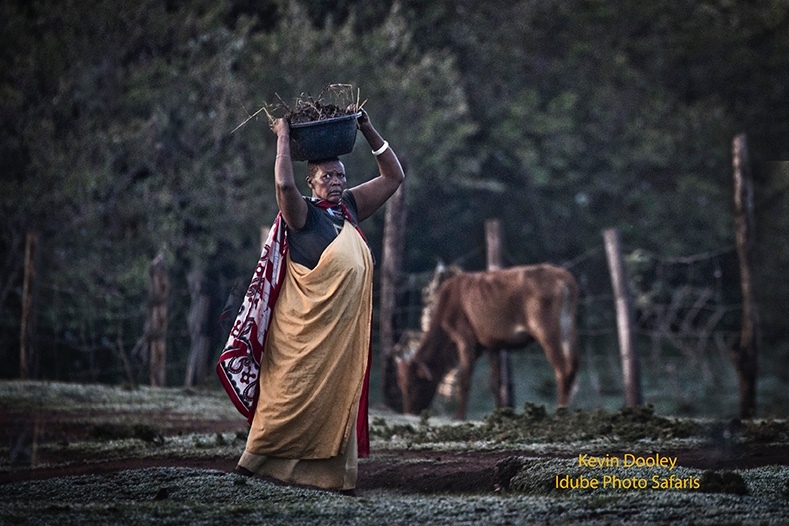 Idube Photo Safaris is so fortunate to have such a great relationship with the amazing folks at the lodge. 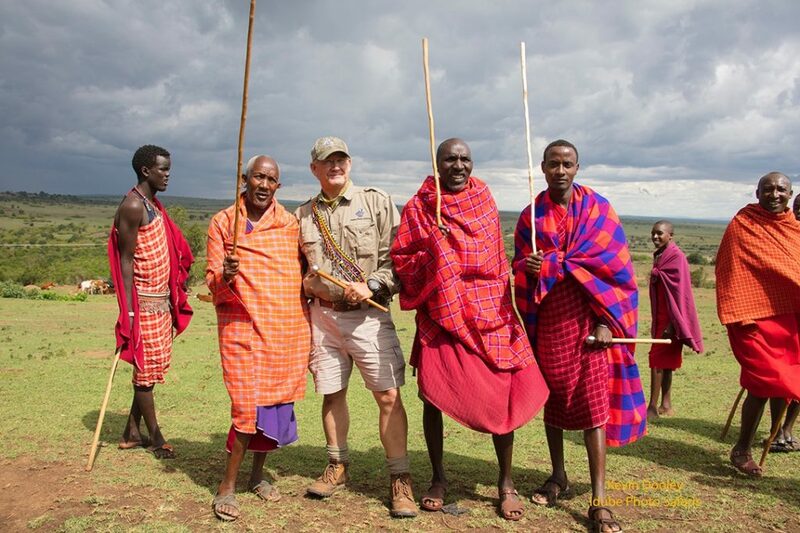 They really go out of their way to make sure my guests get a great experience with the Masai People. The very same village that I have passed by several times over the last few days is now about to find its way into the creativity of my photography. I am very excited. I have chosen to use my Canon 5DS camera body, with over 50 megapixels. This camera is just what the doctor ordered, a power house of extreme image quality. I will use my Canon 28-300 lens. This lens gives me a focal length or zoom capability to compose both wide angle and telephoto images. This Canon L lens is also extremely sharp. The only other lens I brought is my Sigma 150-600 and it is a bit large for this undertaking. I have brought along a small gold/silver reflector just for this part of my journey. I prefer the combo of both silver and gold, as I find the silver to be highly reflective and I like the touch of gold to add a bit of warmth and realism to the image. Gold alone can be way too warm, especially when photographing darker skinned people. I find just about anyone around is willing to give a helping hand in holding a reflector, however I am fortunate that my Masai guide will help me. Our Land Cruiser comes a stop and the Masai warriors are dancing and chanting a welcome song just for my arrival. I feel very honored, humble, and thankful that I can experience such a magical time in such an amazing location. Yes, of course, I am extremely excited to have this photographic opportunity, however, this goes way beyond that. Somehow I find myself lost in the thoughts of fulfilling a lifetime dream. I finally became a participant, that up to this point, I had only experienced through the words of great adventure stories or National Geographic episodes. I love living out my dreams, and it was happening big time. After I got a few images of the dancing, the warriors asked me to join in. 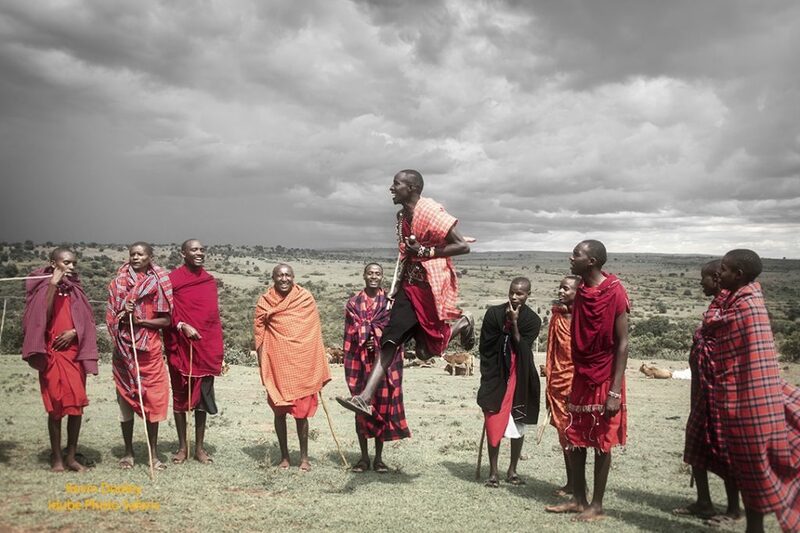 They draped me in Masai traditional beaded ware and we proceeded to share some singing and jumping. The welcoming ceremonies soon came to an end and I was chomping at the bit to get my camera fired up and start creating some Masai portraits. I had the visions in my mind of the types of photographs I wanted to create from this wonderful opportunity. I have been a wedding and portrait photographer for well over 30 years. My job has been to make people look their best by basically hiding the character and hardness that life has brought upon them. I have softened those deep lines that come with wisdom and with age and taken my highest quality camera and lenses and removed the sharpness they produce. I have diffused facial features, wrinkles, double chins, and heart felt expressions that modern day society says is unattractive. Today will be different and I will use the sharpness of a high quality professional lens and the image quality that comes from an extremely high resolution camera. This to embrace all the years of hardship and happiness that the human race can endure. I will capture this beauty through the expressions, the facial lines, the eyes, and the very feelings that make these people so special and honest. I’ll be looking for the very things I try to hide in wedding portraiture. Only I will allow these features to stand tall and tell the story that they are intended to tell. A road map of history and experience within the very lines that are slowly developed and make up the human face. A honest portrait that shows the true character and story of the person. I was looking for some very specific subjects to photograph, the young were still far to unexperienced and unscarred by life. I was looking for the older, the true story tellers of the village. As much as I enjoyed the young warriors dancing, smiling and energy, I needed the village elders for my photographic subjects. 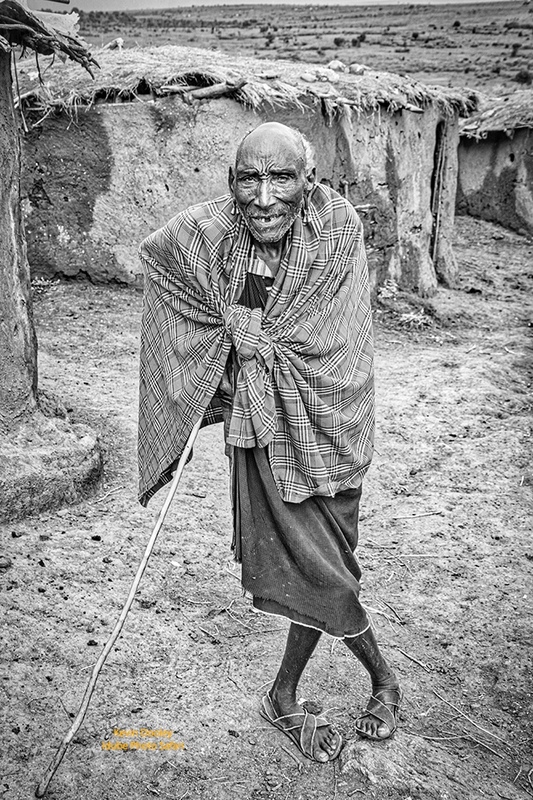 I asked my Masai guide, who was so kindly appointed to me by our safari lodge, for the oldest and most experienced people of the village. After a few words in the local dialect and some moving about I was granted my wish. 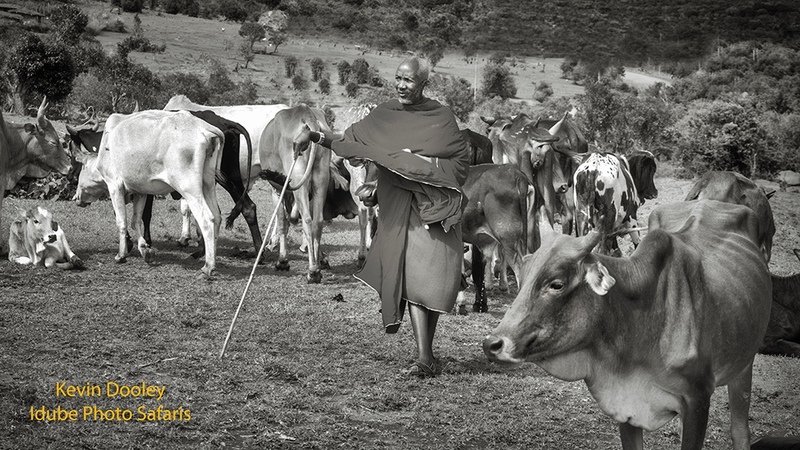 Masai Elder with his cattle. Note the cow in the front right corner provides a nice frame for the remainder of the image. In the distance, I see an older and highly distinguished gentleman making his way towards me. He is weaving through the endless herds of skinny and fly ridden cattle with a long walking stick. The reds, blues, and whites of his clothing and beaded decor are moving with the wind. His ear lobes are cut and hanging with heavy charms. As he moves towards me, I can not believe the reality of the situation. 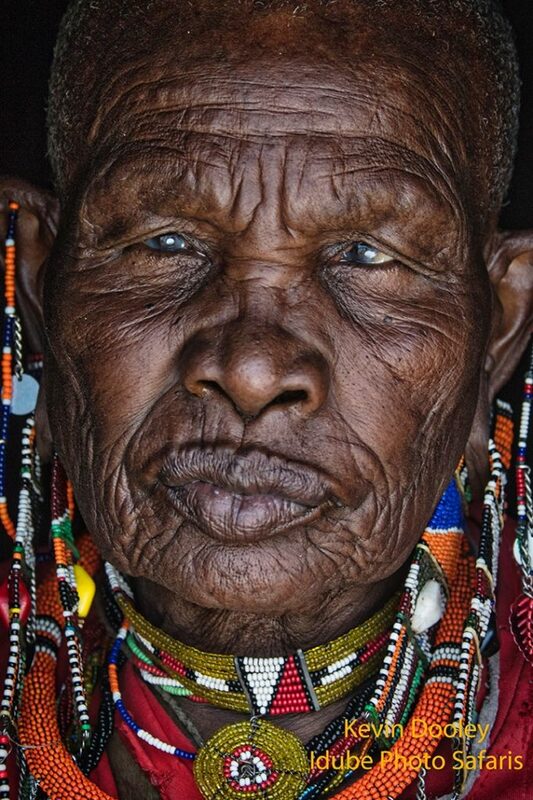 His worn and missing teeth, with eyes so full of history I can see his soul. 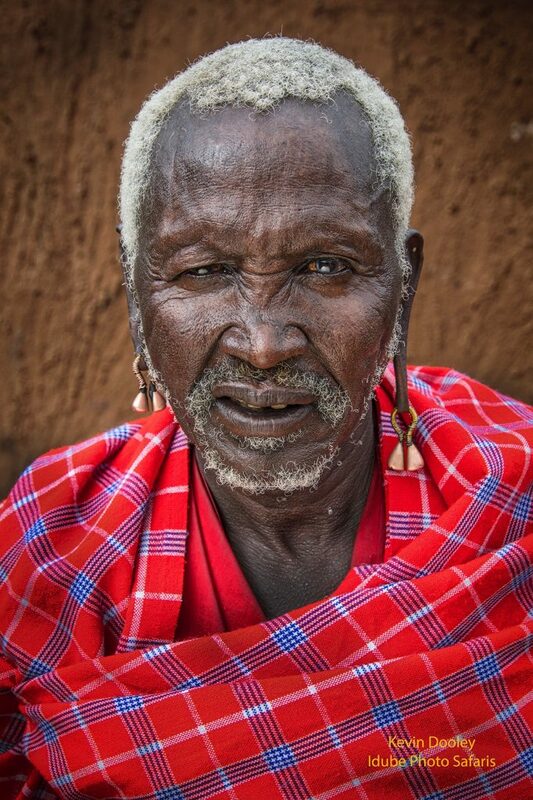 This is the village chief, a well lived, experienced man, and the most incredible subject I could ask for. My heart rate has increased and my happiness jumped to the sky. I was granted a lifetime wish, to photograph a storyteller, a man of great respect, a man who’s face is written with the history and the life of his people. The Village Chief. I decided to show his cows in the background, but out of focus and as a supportive element. There are those times when a photographic situation is so amazing that my mind becomes confused and overwhelmed. Too many choices, too many directions to go in. A perfect subject, perfect backgrounds, great lighting, basically an overwhelming number of choices. This is definitely one of those situations with so many options and amazing opportunities. I find myself confused between faces and the places that support them in a story telling fashion. Do I photograph just faces on their own with bland or dark backgrounds that do not in any way distract from the subject? Of course, I will do both, as the location and the feeling comes to me. Zooming in to a strong telephoto setting and adjusting my exposure to let the background fall into nothingness. An F-stop of very little to no depth of field, a shutter speed fast enough to control any camera movement. An ISO as low as possible, I absolutely do not want any digital noise in my images, I need sharp and clear lines within the faces. I placed the subject in a doorway. The light behind was very dark allowing all the attention to go to the subject. With the same dark background behind the subject as the image above. I have transformed the image into an vintage look. The mid afternoon sky is producing a very soft light, with the sun diffused by thick clouds and occasionally spitting rain drops upon us. This is good in the sense that I can place my Masai subjects in a multitude of locations. 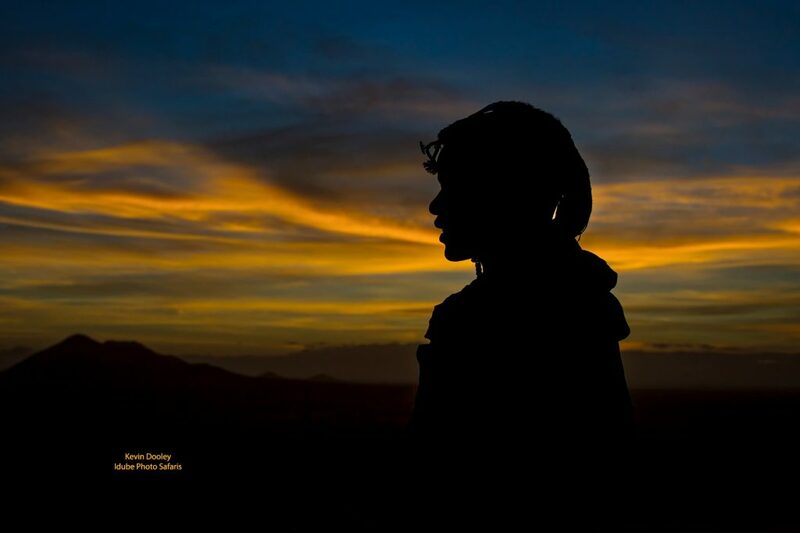 However, it does present the challenge of getting some dramatic and spectacular lighting. This is where the reflector really comes into play and I will need to add a bit of light to my images and the reflector will do the trick. I show my Masai guide how to hold the reflector, tilting it back and fourth, so he can see the light working it’s magic. Yes, a reflector stand would come in handy, but those weight restrictions on bush planes are very limiting. We make do with what we have. We have used a small reflector to increase the light on the face. I have decided to create both up close and environmental portraits. Taking into consideration that I only have one lens to work with I go wide on the environmental images and pull out to 200 or 300 on the close up images. The nice thing about a lens with as wide a zoom range as the Canon 28-300 is that I can create both the wide angle images and close up portraits with the same lens. It's very important to select a multi purpose lens when tight weight restrictions are in place. 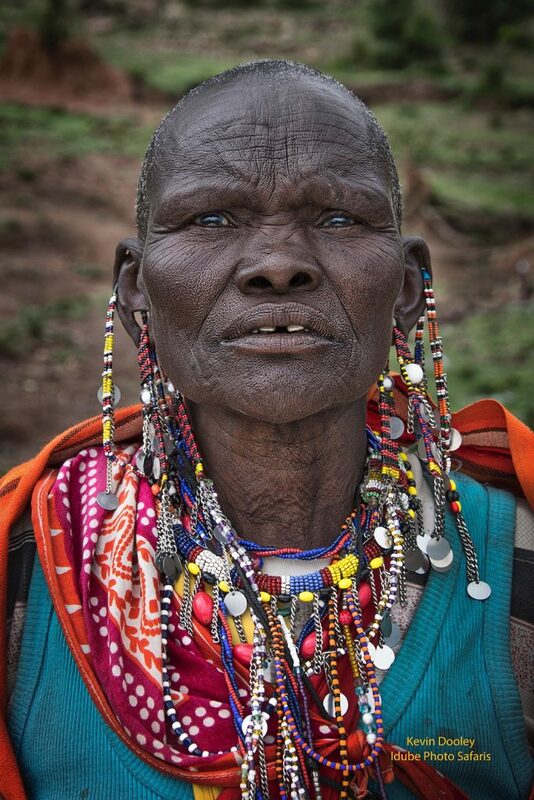 I am excited to get back to the Masai Mara next year and create some more images of these amazing people. My 2019 Gorilla and Masai Mara trip is sold out, however we do have some space still available for the Serengeti Safari for 2019.